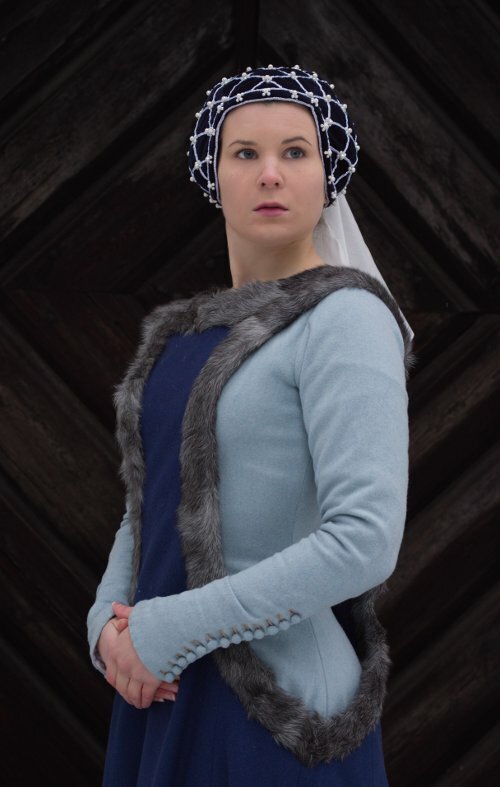 As I have already mentioned with my other medieval projects, one of the things that got me interested in medieval reenacting in the first place, long long ago, were the novels of the Finnish author Kaari Utrio. Her romantic heroines are often described wearing "a surcote with deep fur edged side openings that revealed her tightly laced cotehardie". The large armholes of the sideless surcote were also known as "Windows of Hell", as the sights they offered might arouse temptations. At least in Kaari Utrio's novels some knight (or several) always goes crazy over a flash of white shoulder against the soft fur and a glimpse of feminine curves clad in the aforementioned tight cotehardie (or kirtle). A sideless surcote actually seems to be quite a cliche in reenacting circles, but I blame Kaari Utrio for wanting one anyway as soon as I finally got into reenacting. 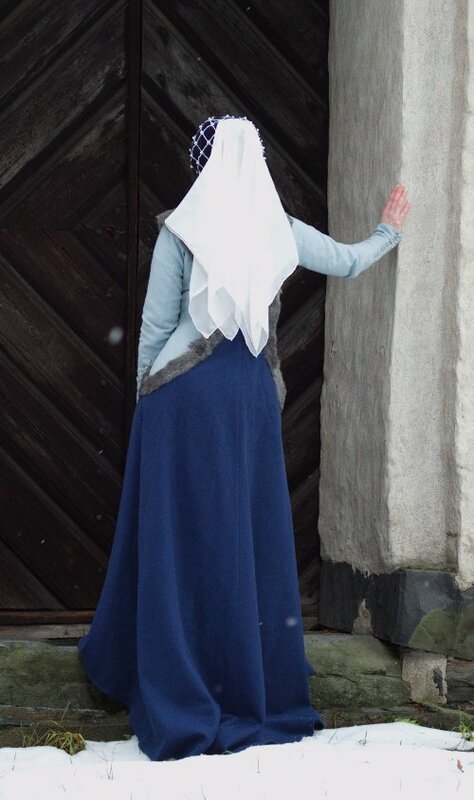 I designed the surcote to be worn with my first medieval dress, the basic kirtle. 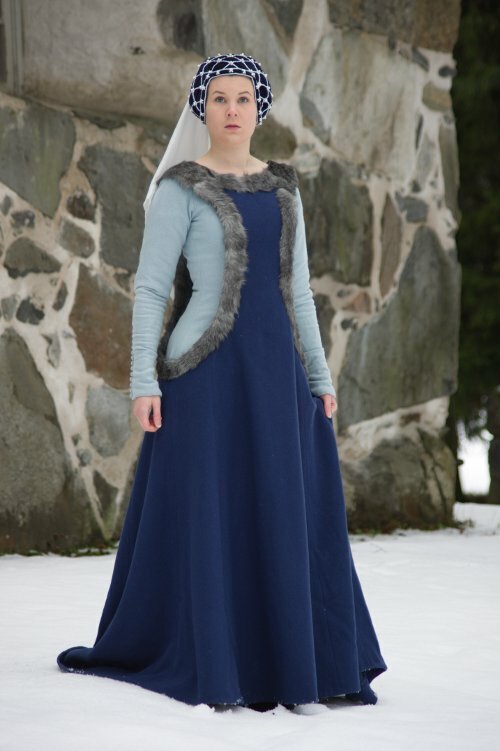 For the surcote color I chose a darker blue, as it would go with the light blue kirtle and most other of my favorite colors. Yes, I am a very blue person. When I'm not wearing black, that is. I found a nice wool at Stockholm and a grey fur coat at UFF sale. My knowledge of fur is very limited but better informed persons have guessed it to be rabbit. Surcotes seemed often sport fur edging on the hem too, but I wanted to be modest and save the rest of the coat for other purposes. A sideless surcote with this deep armholes is common on period pictures, but obviously it wasn't worn widely outside court. Then again, I play a noblewoman, and moreover I don't even aim for a believable period persona but rather concentrate on making clothes that interest me. I had bought all they had in the shop, which was exactly 195cm. Usually I buy way too much just in case, so for once I really had to plan how I would cut it. I actually made several plans with pencil and paper and ended up piecing awkward shaped pieces, which is very period. 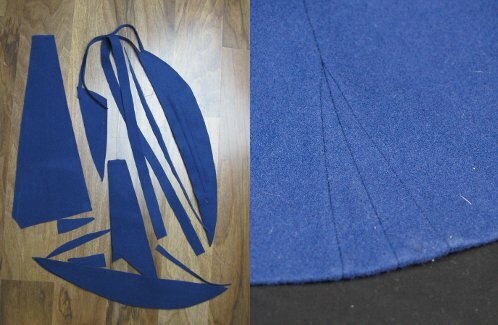 I had made a mock up of the top of the surcote (though it is so simple, I had to be able to cut exactly) and cut the hem as wide as I could get out of the fabric. Surcotes seem to have been cut quite straight, but mine just looked so much better with a center back gore beginning at the waist that I couldn't resist. I had just enough material to get the tiniest train. Usually I'm horrified of anything trailing on the ground, fearing it will be torn, but with the felted wool I felt secure enought to allow myself the luxury of a train for once. 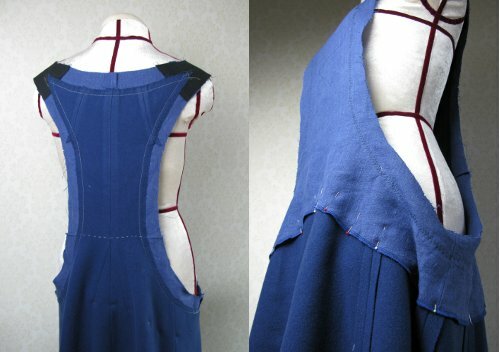 Though a sideless surcote seems a very simple garment I spent considerable time on it. Being a control freak I was worried about all the weight of the dress being supported mainly by the shoulder straps, and the curved armhole edges stretching. The second-hand fur felt a bit fragile already and I was afraid of it tearing under the strain of the weight of the skirts. Thus I took the precaution of reinforcing the shoulders with coutil and the armhole edges with cotton tape. 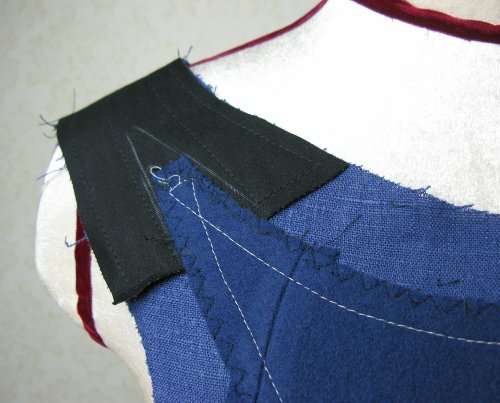 I lined the bodice with blue linen. Due to the lack of time I finished its lower edge with overlock and sewed it on the wool loosely by hand. I wonder why using overlock on a period garment feels so much more heretical than normal machine sewing? I had learned something from my last fur trimmed project, 18th century cloak, and realised I would have to shape the fur and not just put a straight strip on a curved edge. My initial plan was to make the shaping seams by hand, but luckily I asked my workmate Reija. 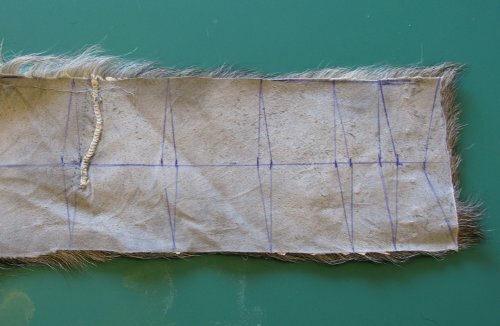 She gave me loads of valuable advice about working with fur, for example that fur can be seamed with loose zig zag which is then pulled open so that the edges lie side to side. As my half retired little sewing machine tends to make loose stitch whatever I try, I suddenly realised that I happen to own a passable fur sewing machine! Of course the seaming was slow and laborious still, and I had to redo some of the seams, but still it was a lot faster than handsewing. Reija also adviced me to use fabric tape to reinforce the fur if needed, and as I didn't believe my zig zag seams to be very strong I put tape on all of them. 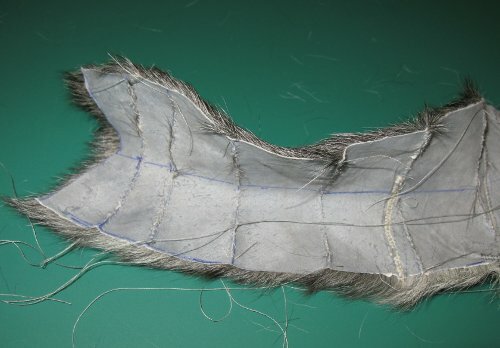 So, after a while I found not only my sewing room covered with rabbit hair but also myself in posession of several curved strips of fur joined to form an edging ready to be sewn on the surcote. I sewed the fur on the right side from the wrong side of the fur and turned it over the edge, and then sewed the other edge on the wrong side by hand. Still following Reija's advice I had reinforced the hand-sewn edge with fabric tape. I do own her a lot of the success of this garment! The finished edging was surprisingly neat and felt secure, especially the shoulders interlined with coutil. I had planned to wear the sideless surcote at my first SCA event, no less than the Baronial Investiture of fall 2011. Like with everything else at that time I was in a real hurry to finish it in time, and I ended up sewing the hem very hurriedly just before rushing to the feast on Friday night. I had originally planned to add some embroidery too, but came to my senses as the Investiture was approaching fast and decided to add it later. We all know what happens to these decicions, of course... Anyway, the surcote looks nice with just the fur for decoration, so I don't see myself getting into the embroidery very soon. I might rather make a more elaborate kirtle to wear with it sometime later. For more about the cute bling-headdress, go here. Many thanks for Reija for her advice on working with fur!